Is it just me, or is classical French cooking coming back into fashion? Three new French restaurants that I know of have opened in the county in the last while, so there must be something in it. When I think of France, I think of their favourite ingredient, onions. Onions are a much underrated ingredient in the kitchen, but are so important to our health and overall wellbeing, as well as being a cheap and tasty vegetable. There are so many different uses for the common onion in cooking, my personal favourite is just fried onions with steak, or deep fried onion rings in a buttermilk batter. They flavour most sauces, soups and stews, and many dishes, but here are a few of my favourite onion recipes. This is a really easy soup to make and it tastes so rich. Strange as it only uses basic ingredients and a drop of wine. In a large saucepan, sauté the onions in the olive oil on medium high heat until well browned, but not burned, about 30-40 minutes (or longer ). Add the sugar about 10 minutes into the process to help with the caramelisation. Add garlic and sauté for one minute. Add the stock, wine, bay leaf, and thyme. Cover partially and simmer until the flavours are well blended, about 30 minutes. Season to taste with salt and pepper. Remove the bay leaf and throw away. 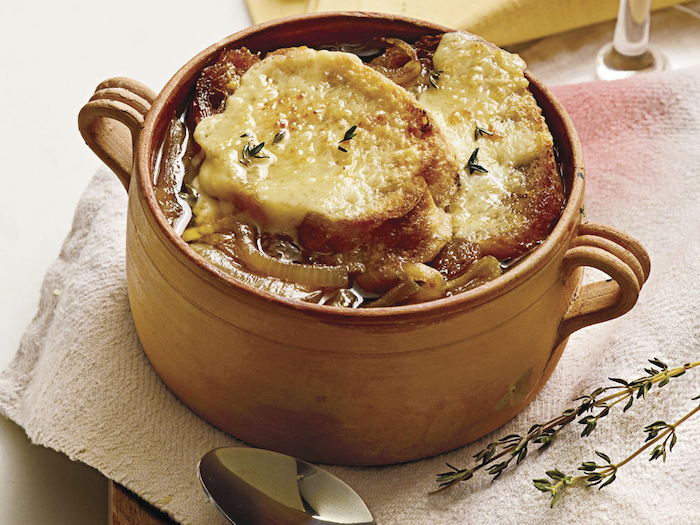 To serve you can either use individual oven-proof soup bowls or one large casserole dish. Ladle the soup into the bowls or casserole dish. Cover with the toast and sprinkle with cheese. Put under a grill for five minutes or until the cheese bubbles and is slightly browned. Serve immediately. This makes about 24 tartlets, ideal for a party, or upcoming Communion food. You will also need a 8cm pastry cutter and two 12-hole bun tins, well-greased. Pre-heat the oven to gas 180°C. Roll the pastry out as thinly as possible. Use the cutter to stamp out 24 rounds and line the tins with them. The pastry will stand proud of the rim of the cups to allow for shrinkage. Then prick the bases and brush with the beaten egg. Now bake on the middle and top shelves of the oven (swapping them over halfway through to ensure even browning ) for about 10 minutes, or until the pastry is just cooked through, then leave to cool on a wire rack. Meanwhile, for the filling, melt the butter in a large frying pan and cook the onions very gently, uncovered and stirring often, for about 30 minutes, or until they have turned a lovely golden brown caramel colour. Then leave to cool and set aside until needed. Now whisk the egg with the cream and mustard in a jug and add some seasoning. Next, spoon a little of the onion mixture into each pastry case, spread it out evenly and pour the egg mixture over. Cut each cheese log into 12 thin slices (wiping the knife between slices to cut more cleanly; the cheese is quite soft, so you may have to reshape a few slices into rounds ). Place a slice on the top of each tartlet, then top with a sprig of thyme and a sprinkling of cayenne pepper. Bake for 20 minutes, or until puffy and golden, and there you have it, delicious and quite posh caramelised onion tartlets with goat’s cheese and thyme.